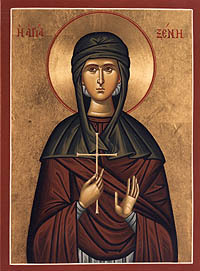 St Xeni is known to have been born into an upper class family of Rome and to have been baptised with the name of Eusebia. She also has been known to have taken life very seriously, harbouring a piety which went undetected even by her parents, who placed more emphasis on her social training than on her spiritual guidance, despite the fact that they were dedicated members of the Christian faith. Church attendance for her family was regular and sincere but lacked the intensity felt by the daughter, which escaped the notice of the parents even when she joined them in their many acts of charity, which they could well afford. Considered unsmiling and distant by youngsters who tried to reach her heart, the quite personable and lovely Eusebia endeared herself to the community as a whole who construed her quiet solitude as difference and not the indifference seen by those who sought to probe the inner reaches of her mind which was preoccupied with thoughts of the Saviour. As she grew into her Saviour however, the comparative isolation which she found from time to time grew more and more elusive as families gathered closer to hers with sons who would have her as a bride. It was the family that arranged nuptials, and she was barely seventeen when a husband was selected for her from among the many eligible young men of Eusebia's social level. She had made a decision for Christ and rather than create any unpleasant scenes which might mark disobedience to her parents' will, she observed that calling she heard to a higher will, and she decided to quietly slip away. With the assistance of a servant and confidante, she arranged passage on a boat bound for the Holy Land and left unnoticed with some regret that she had to leave her parents in this manner but with high hopes of fulfilling her lofty ambition. Eusebia's first order of business was a visit to the tomb of Jesus Christ where she paused in prayer for divine guidance and for forgiveness for having offended her parents. After several such prayerful visits, she, for reasons known only to her, left the Holy Land to go to the island of Kos in the Aegean where she met a highly respected monk named Paul, who saw at a glance the grace within this gentle creature of God whom he dubbed "Xeni," meaning the stranger, which is what she considered herself, and the name she adopted from there on. Paul sensed that there were great things in store for this visitor to his island and arranged to have her settle in an isolated hut which afforded her privacy and the solitude she needed for prayer and meditation. She emerged from isolation after a period of time with an aura of the Divine so evident that Paul urged her to make herself known on the island to do what she could for a people that knew little but poverty. She not only brought to these islanders a rare kind of spiritual guidance, but a rarer still power of healing which made her the cynosure of all who came to revere her in life as one sent from heaven. When her friend and benefactor, the monk Paul, was made bishop of the area, he asked Xeni to become a deaconess of the Church, an invitation which she hesitated to accept until a contingent of islanders prevailed upon her to put aside her doubts and assist the bishop who would in turn assist her in doing God's work. Forewarned in a vision of the imminence of her death, Xeni walked out of the village quietly to her bed and fell asleep in the Lord on January 24. The beam of light that shone brilliantly in her room as she died left no doubt as to her ascent to Heaven.